If you like cabbage, you'll love this. Heck, judging by the feedback I got this weekend, if you don't like cabbage, you may love this anyway. Sabzi is just a vegetable side dish. And the flavor is nicely Indian. 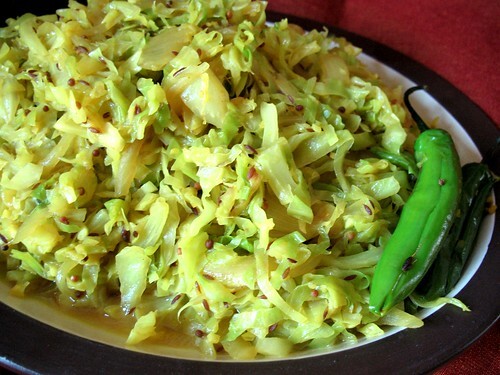 Mostly, it's sweet tasting cabbage with just an undercurrent of warming spice. Heat the oil over medium-high heat in a large saute pan. Add the mustard and cumin seeds and cook until they pop, just a few seconds. Reduce the heat to medium and saute the onion until it begins to brown. Add the ginger, garlic and peppers. Cook until aromatic, then add the cabbage, turmeric, salt and water. Bring to a boil and simmer until the cabbage is cooked and the water has mostly boiled off. Remove the peppers if desired. The cumin seed, added to the oil will give it a nuttier and, I think, sweeter flavor than ground cumin. Aside from that, though it's the same thing you can swap it 1:1. Thanks! I will be making this this weekend!